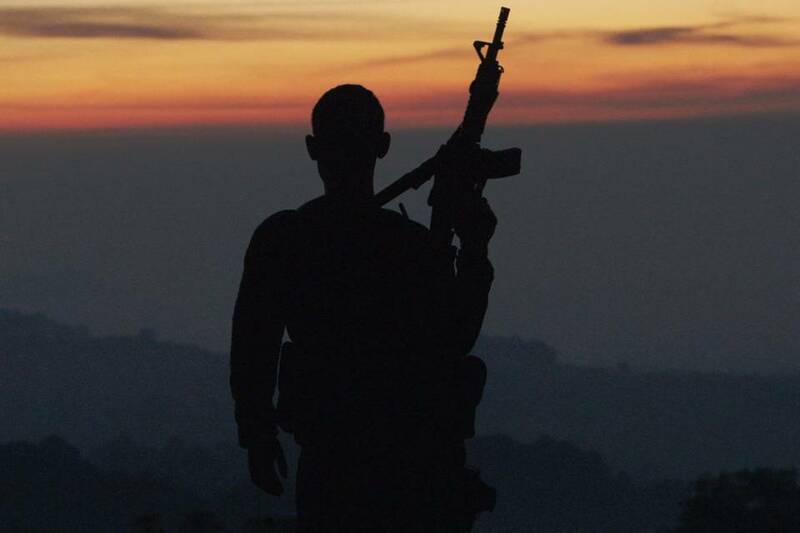 A scene from ‘Cartel Land,’ a documentary on the drug war by Matthew Heineman. In addition to private investors, ‘Cartel Land’ was financed by cable network A&E, which paid for TV rights. For bigger-budget movies that play nationwide in theaters, Hollywood can be one of America’s more transparent industries. Box-office receipts usually are a fraction of a movie’s revenue, but they are a good predictor of what the sum total will be, making it relatively straightforward to determine within weeks of a film’s release whether it will be a financial hit or flop. Outside the major studio system, though, that is increasingly not the case. Low-budget films rarely get a theatrical release these days, and if they do, it typically is in just a handful of theaters meant to generate reviews, awards consideration and the perception that it is a “real” movie. The vast majority of indie-movie viewing today takes place via video-on-demand retailers such as cable boxes and Apple Inc.’s iTunes, making them the primary source of revenue for such films. Box-office grosses, typically in the hundreds or even tens of thousands of dollars, essentially are meaningless. Whereas reliable box-office tallies are made public on a daily basis by websites such as Box Office Mojo, no such mechanism exists for video-on-demand, for which retailers retain their own data. Independent filmmakers rarely know how many times their movie has been rented on Amazon.com, streamed on Netflix, or purchased on DVD. Typically, they rely on quarterly statements from a distributor to learn how much revenue their movie has earned and how much that company has spent on expenses such as advertising. In between quarterly statements, filmmakers and agents typically pepper distributors with questions. “It can be like pulling teeth to get any information, and some filmmakers get frustrated by how long they have to wait,” said Rena Ronson, head of independent film for the United Talent Agency. In a bid to stand out from competitors, one independent distributor, the Orchard, is making a radical play for transparency. The company, which recently released “Hunt for the Wilderpeople”—its biggest box-office success to date with $4.4 million (a pittance for major studios but real money in the indie world)—has created a new digital platform that shows producers what the company has spent, what the movie has made from each revenue source, and how those numbers have progressed. It also includes the Orchard’s projections several years into the future, including the point at which the movie’s revenue will exceed expenses and begin to generate profits in which filmmakers typically share. The Orchard will be touting its open approach to finances at the Toronto International Film Festival, which began Thursday , where the company is playing three films it owns and shopping for new ones. Viewed by The Wall Street Journal, the beta version shows that “Cartel Land” has generated about $1.2 million in revenue—after companies along the way, including movie theaters, video-on-demand retailers, and the Orchard itself took cuts—since its release in July 2015. Nearly $900,000 came from video-on-demand rentals. The Orchard’s expenses, meanwhile, total nearly $1.5 million, including a $500,000 advance it paid for the rights to release the movie, $167,000 for marketing and more than $600,000 on publicity, some of which went toward a campaign that landed an Academy Award nomination. Demonstrating how long it can take even a moderately successful independent film to generate profits, the movie is projected to recoup all of the Orchard’s expenses in September of 2017 based on expected future sales to pay-television or streaming outlets such as Netflix. “This gives me an intelligent way to talk to my investors about how the film is doing and what the future holds,” said “Cartel Land” producer Tom Yellin. 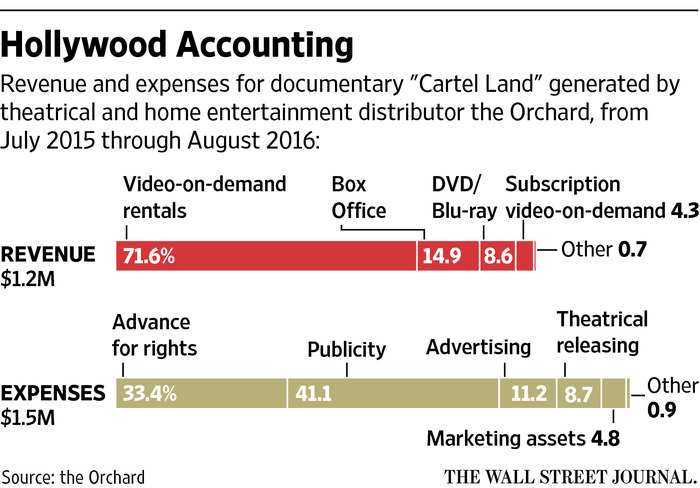 In addition to private investors, “Cartel Land” was financed by cable network A&E, which paid for television rights. The movie cost about $1.5 million to produce. The Orchard picked it up for theaters and home video after it screened at last year’s Sundance Film Festival. The amount paid by the Orchard was the $500,000 advance in addition to a share of the profits after release costs have been recouped. After the new digital interface launches, the Orchard hopes to update the speed at which it integrates data from retailers such as cable systems, and includes comparisons to other movies in the same genre, said Messrs. Davidson and Navin. That could help to address another problem for indie filmmakers: Even when they know how their movie has performed it usually is impossible to know how they stack up against competitors because there is no comprehensive database of video-on-demand sales as there is for box office.